 Jack O’Pumpkinseed, a mountain-style cheese from Switzerland. Cranberry goat cheese log from Montchèvre. Pumpkin spice goat cheese log from Montchèvre. Another Pumpkinseed Gouda from The Netherlands, at Sam’s Club. 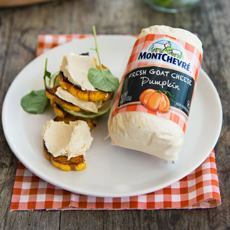 If you read our articles on Halloween Cheeses, you know that many of them are colorful representation of the Harvest Season. They certainly work for Thanksgiving. But for a smashing Thanksgiving-specific cheese plate, check out these holiday-themed cheeses: a blue, a goat, and semihard cheeses (Cheddar, Gouda, Swiss). Blue Cheese. No cranberries or pumpkin seeds here, but blue cheese lovers will appreciate the hot chiles mixed into Carr Valley Glacial Wildfire Blue, an artisan cheese from Wisconsin. Cranberry Cheddar, Jack, Stilton and Wensleydale: different retailers will carry one or the other. Seek them out: They’re sure to be a hit. Swiss-Style: Jack O’Pumpkinseed. 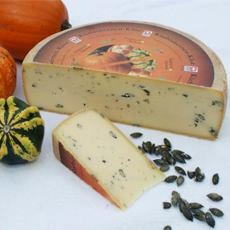 This washed rind cow’s milk cheese from Switzerland has chopped roasted pumpkin seeds in both the paste and the rind. The paste is very smooth with a creamy mouthfeel. Bonus: tiny eyes. Available at iGourmet and elsewhere. Goat Cheese. 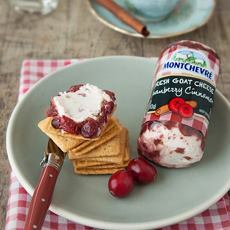 A number of cheese factories make fresh goat cheese logs rolled in dry cranberries. The Cranberry Chevre Log at Trader Joe’s is just $3.99. 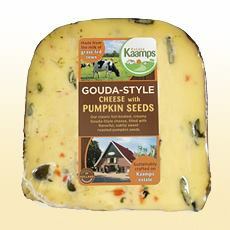 Gouda-Style: From The Netherlands, Kaamps Gouda-Style Cheese With Pumpkin Seeds is a popular item at Sam’s Clubs (more information). The semi-hard cheeses are great for a seasonal cheeseburger. Apple chips. Our favorite brand is Bare Fruit. Seasonal crackers. We especially like the Oat Cakes and Rye Cakes from Effie’s Homemade. Spiced pumpkin seeds. You can buy them (our favorite is Superseedz or season and roast your own. You can bake raw, hulled pumpkin seeds at 300°F for 45 minutes until golden brown, or roast them in a skillet on the stove top. 1. PREHEAT the oven to 300°F. Toss the seeds in a bowl with the melted butter and salt. Spread in a single layer on a baking sheet or in a baking pan. 2. BAKE for about 45 minutes or until golden brown, stirring occasionally. 1. PLACE the seeds in a dry heavy skillet, 9- to 10-inches, over moderate heat. Stir constantly until the seeds are puffed and golden, 4 to 5 minutes. 2. TRANSFER to a bowl. Stir in the oil and seasonings; toss thoroughly until all seeds are coated.